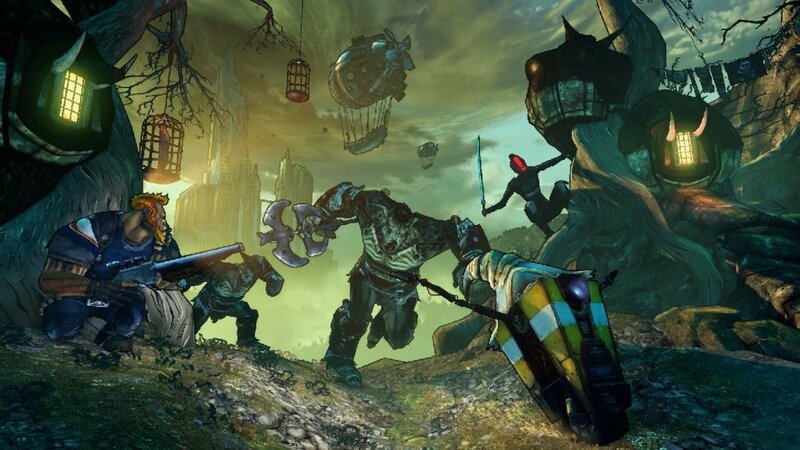 If nothing else, the DLC for Borderlands 2 has been uneven in quality. After a strong start with Captain Scarlett and Her Pirate's Booty, the next two installments, Mr Torgue's Campaign of Carnage & Sir Hammerlock's Big Game Hunt didn't click with us quite as much. Fortunately, after putting about a half hour into the upcoming Tiny Tina's Assault on Dragon Keep, it seems like Gearbox may be delivering the best expansion to the Borderlands world yet. Assault on Dragon Keep begins with the vault hunters sitting down for a game of Bunkers & Badasses with Tiny Tina acting as the dungeon master. You're dropped into a fantasy roleplaying setting, complete with skeletal archers, orcs, and treants. Much like The Zombie Island of Dr. Ned in the first game, the change in setting is quite drastic, and the visual variety is welcome. Some new mechanics are introduced - such as immortal enemies, who can only be killed if you draw an ethereal sword out of their body once you knock them out. Fairies can be acquired, and they'll follow you around providing passive buffs to your character. One of the nicer touches is the fact that you roll a D20 before opening any chest - high rolls net you better loot, and you can even pay a small fee to be able to roll a second D20, adding the results together. Since Tiny Tina is actively dungeon mastering your experience, certain things about the world can change on her whims, usually provoked by complaints from the vault hunters that she's being unfair. NPCs can be replaced by other characters, environments might change, and enemies might drastically change in level on the fly. Most of this stuff happens to punctuate the jokes in the writing, which is entertaining and serves to tie the narrative more directly to the gameplay. I know Tiny Tina herself is a love her or hate her kind of character, but nearly every joke (and there are a TON) I heard during my playtime hit. Hearing Brick talk about how he chooses to play as the siren (and his siren is the prettiest) was great, as was Lilith speaking in character. It's good stuff, and the larger meta story of the campaign is surprisingly deep.